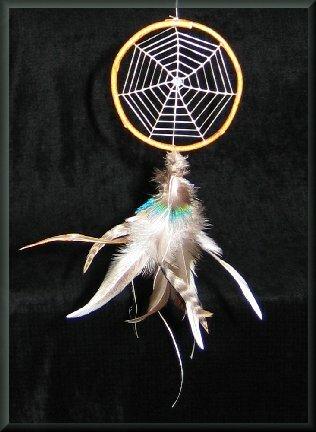 The spider web dream catcher shown below right is very similar to the original dream catcher that has been a tradition for a very long time. It is about 3 ½ inches across, made of red willow gathered in early spring when it is the brightest color. Feathers were often added so that the parents could see the good dreams slipping down the softness of the feathers. We use7 turns around the spiral to represent the number of legs of the spider, and a single stone in the center represents Asibikaashi, the spider. The seven points or rays represent the Seven Fires, the seven prophecies brought to the Anishinabeg by the Seven Prophets.